Well…luckily, for all of us, there are people who love figuring out some of the most mundane of details about the game. And if you want mundane…then the Wiki is a great place to search. Low and behold, the following map is available to download, and allows you to see all of the available land, and the costs, right up through January 2019. 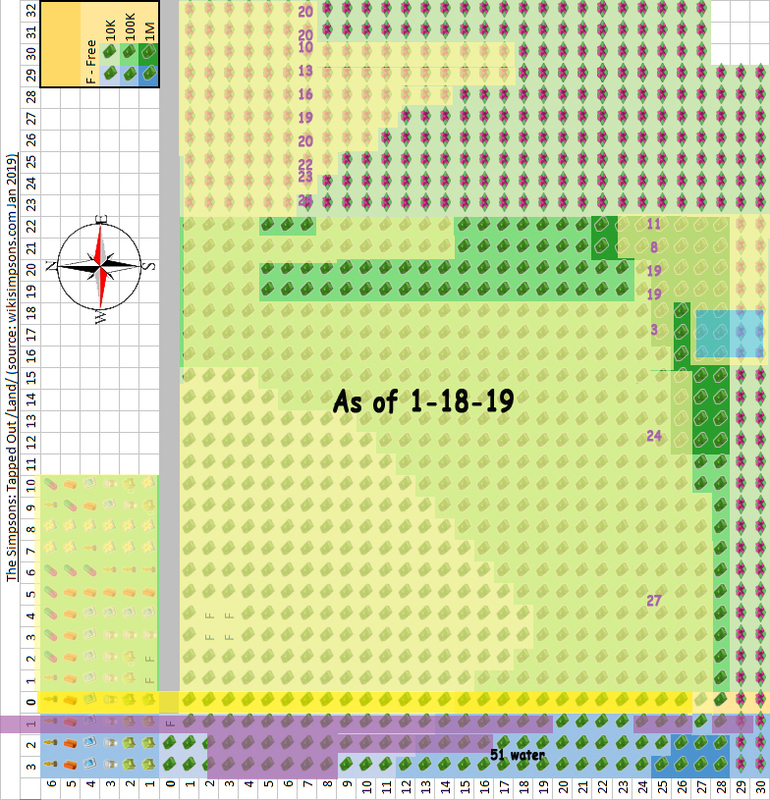 But, how many land plots do you have left? For me, it really pointed out what a strange mess of appendages I have used for my expansions. Part of the reason for this, is the forced land use that came with the relocation of Krustyland, the addition of Itchy and Scratchy Land, The Zoo, and the Halloween segments…that all showed up in areas far above areas I had already developed, and were not an option. EA just said,”Here’s where this goes!” BOINK! OK…I guess we’ll go with that. Like others, I could have opted to place these events in other areas…but didn’t have enough land unlocked at the time to do that. So...BOOM! Out to the Wild East they went, and have stayed. I had this idea of keeping some of the HUGE Theme Park/Recreation areas away from my “town proper” areas. Others have used huge chunks of water, I just left strips of undeveloped land. But, to be honest…until I saw the map, and did the math, I had no idea I had soooooooo much land left to purchase! As of today, I still have 298 Land Tiles remaining and 51 Water Tiles. I guess I just don’t mind tighter land use…but even with this, I have loads and loads of sections of water, huge sections of woods and flowers, and a pretty barren desert area. However…the real problem for me…is the continuing ITEM LIMITS that have been set by EA (which is currently set at 12,200 items). Yes…they increase them a bit with every update. But, not enough to make me go nuts and expand out my designs with additional decorations and plants/trees. Well…for me, the answer about hoarding for a big donut payoff is a clear and obvious, NO! Why? Do the math. 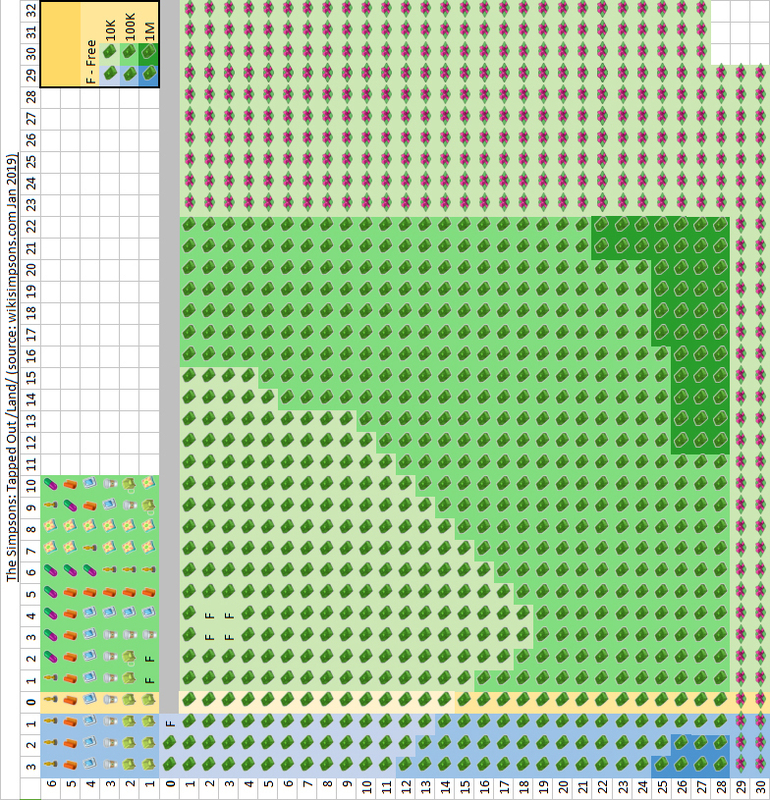 With 298 land and 51 water tiles available, it will take me 174 days to actually max out the land buy-out, so I can begin “hoarding” tiles to convert to donuts. That’s almost 6 months…and it would actually increase when/if EA gives us more land. Ironically…those who are hoarding, are counting on trying to guess when EA will give us new land. I am just resolved to the fact that I will not likely ever use the “Conversion Tool” for my game. Oh well…it was a brilliantly evil diversion. Kind of like building a wall before dealing with anything else that actually matters…but I digress. I’m fine with that. I earn between 45 and 60 donuts a day with KEM farming, Railyard Farming, and Daily Tasks. That means that during that same 174 days, I’ll earn between 7860 and 10,440 donuts. So…am I bummed that I won’t get a chance to use the GGR converter? Not. So. Much. But, I WILL be very grateful that I don’t have to grind during events to try and earn land tokens, if I do want to expand my designs. So, YES…the GGR was a great buy. Period. I’m tired of debating two things related to this. And if you admit to one, you have to admit to the other. Water on the LEFT side of the screen…especially if you straighten out the grid as I have done in the first map earlier in this article. If you take a close look at my map, I have also placed the compass in the CORRECT position, to match that of the ONE TRUE SPRINGFIELD! Yes. This implies it could be one of the many Springfields in the Midwest. 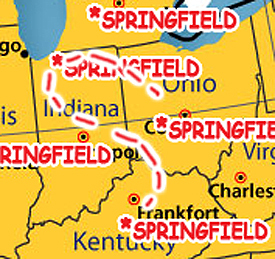 There are a TON of Springfields in the United States. 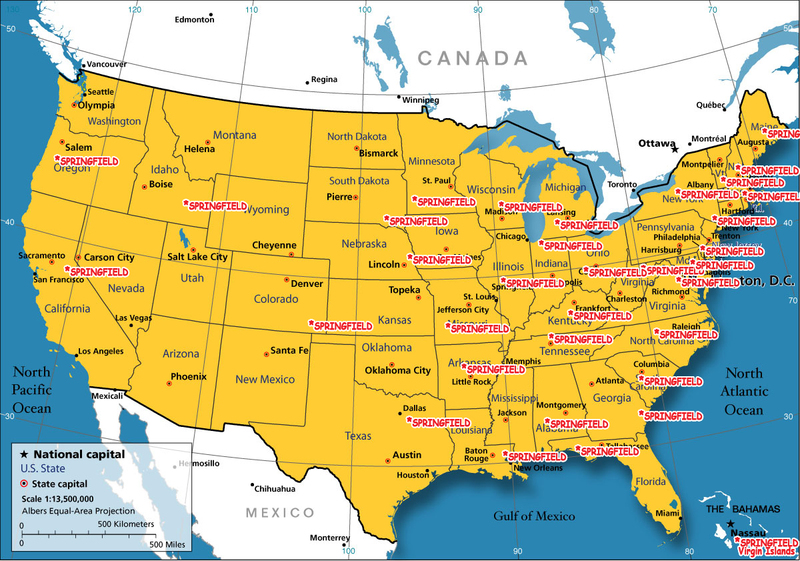 And surprisingly, it is not the most common town/city name in the United States. That would be “Washington.” (44) Springfield is next, followed closely with “Franklin” at 35. Yes… I placed every Springfield on this map by hand. At 3:30 in the morning when I couldn’t sleep… talk about grinding with an obsessive passion! But, Let’s Break This Down. But, let’s start ruling them out. If we are using the logic that Springfield has water to the “Left” (or in this case, WEST), There are only four out of the entire mess of Springfields that qualify; Springfield, Oregon, Springfield, California, Springfield, Indiana and Springfield Florida. Yes. I said it. Florida…. Because it does sit with the Gulf of Mexico kinda leftish of the town. California? Nope. There are no real clues that would remotely make it California…especially this tiny blip on the map that isn’t really anywhere except “almost to…” a bunch of other places in California. Furthermore, as anyone with a little aviation history knowledge knows, the Wright Brother’s plane from that year, only had a small fuel capacity (5 mile range), and crashed a lot. It would take about as much time to fly from Ohio to Kentucky, by way of Indiana, as it does to save up enough land tile certificates to make the GGR worth doing if you want free donuts. So…Indiana is clearly lying about being the right Springfield (they probably bought off the Simpson’s writers with Hoosier Hoagies or something. Pathetic!). That leaves Springfield, Oregon. 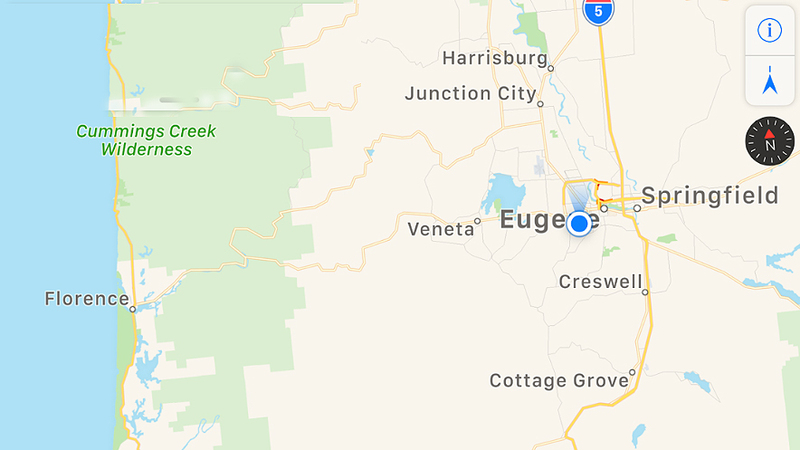 Which as I have revealed countless times, is just a couple of hours south of where Matt Groening grew up…and is right next to Eugene, home of Skinner’s Butte, and a bunch of other Simpson’s references. While the ocean is a few miles off to the West (the correct position of the water for TSTO) the Willamette River actually runs right through Springfield. So, yes…there is water to the West, as it should be, both near and an hour away. Case Closed. Up is North. Left is West. Springfield, Oregon is the One TRUE Springfield…and the founding fathers were really, really, really lazy about naming towns. 1. The Golden Goose Realty is great for generating free land tiles…not so great for donut farming. Check the map to see how many land segments you still have to unlock. 2. 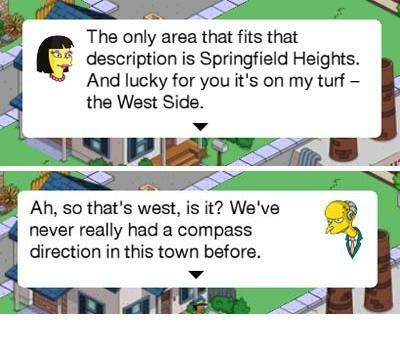 On a map of TSTO…NORTH IS AT THE TOP…because the Water is West. 3. Springfield, Oregon is the One TRUE Springfield. OK. Done. Now I’m going back to bed! OH…WAIT!! 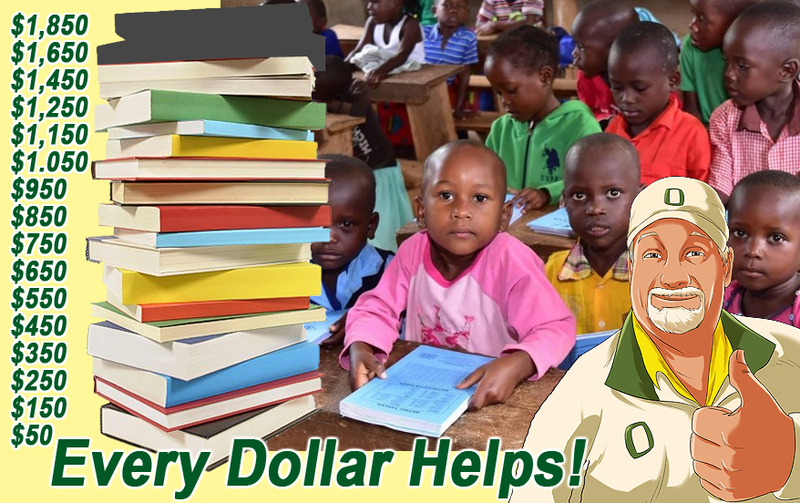 Not until I thank all of the amazing TSTO Addicts who dove in to donate to our fundraiser for Schoolbooks and Supplies for the village school in Buyijja, Uganda! You people (especially a couple of you) are simply the best! Every dollar will go to work to offer unconditional Peace, Hope and Love to these kids who have so very little. TSTO Addicts are the BEST! This entry was posted in Friday Filler, Tapped Out and tagged free donuts, Should I Spend Donuts On, Tapped Out Tips and Tricks, The Simpsons, The Simpsons Tapped Out, TSTO, TSTO Addicts, TSTO Buyijja Projects, TSTO Community, TSTO Free Donuts, TSTO Tips & Tricks, TSTO Tips and Tricks, TSTO Uganda Projects, TSTOCrankyOldGuy, TSTOPatric. Bookmark the permalink. When I looked at my exported Springfield map tonight I saw extra green space in the far right.. when I checked Springfield, sure enough.. right (East/S. East?) corner squares are open for purchase! Sorry, Patrick, game canon has directions. The mountains are west, which means the ocean is south. Then you are arguing for Florida? Pfffttt…. The official map shows Squidport on the south coast of a bay adjacent to the Pacific Ocean. 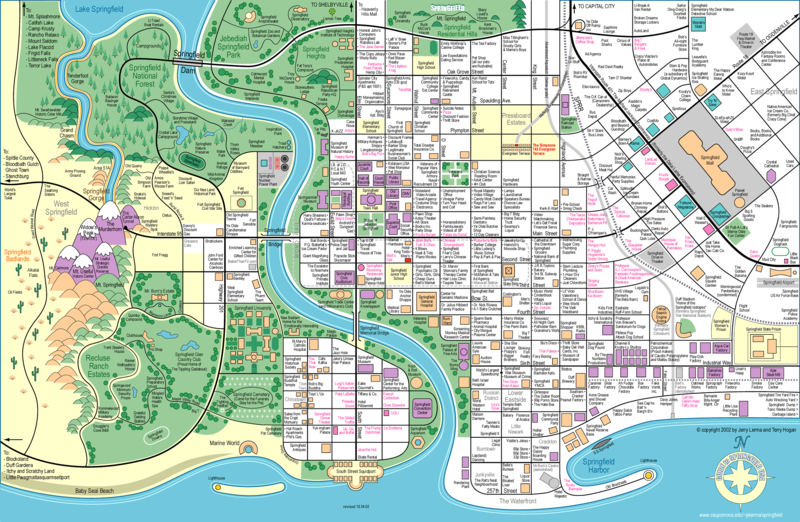 What’s the URL of the original unedited Springfield map? I went to WikiSimpsons, and couldn’t find it. So I tried to ask them, but the “ask a question” page had a busted Captcha on it! So I registered (it’s supposed to skip the Captcha if you’re logged in), but that didn’t work either. NEVER MIND! I’m a moron! I was so taken by your version, I didn’t even notice the un-edited original at the top of your post. Sigh. Old-timers disease, indeed…. Thanks for using my map but I don’t appreciate the modification that have made (rotating, north) Cookie Kwan say Heights is on the West Side. Plus, oh! Plus, anyone who’s ever done any orienteering knows that the top of the map is magnetic north! Holy cow, I actually remember more than I thought from my days as a Scout, shocking. Also, when you go to your Friends, the initial display shows sample towns with boardwalks, with the water below (south? )… Good call re Cookie Kwan! And the whole canon thing… made up by WIKI peeps…who are regularly wrong. Lol! I was so torn on purchasing the GGR and eventually came to the same conclusion as you Patric. I’m so grateful for this post because I did not do a tenth of the research that you did. You confirmed my original thought. Thanks so much for this post! Sir, I agree that the Golden Goose Realty was worth the 🍩 ‘s, and I’m not worried about running out of Land Tokens (2 generated every 24 hours would take probably more days than one year to buy ’em all for me). I agree about the ‘maximum items limit’ being an irritant (well, for me? 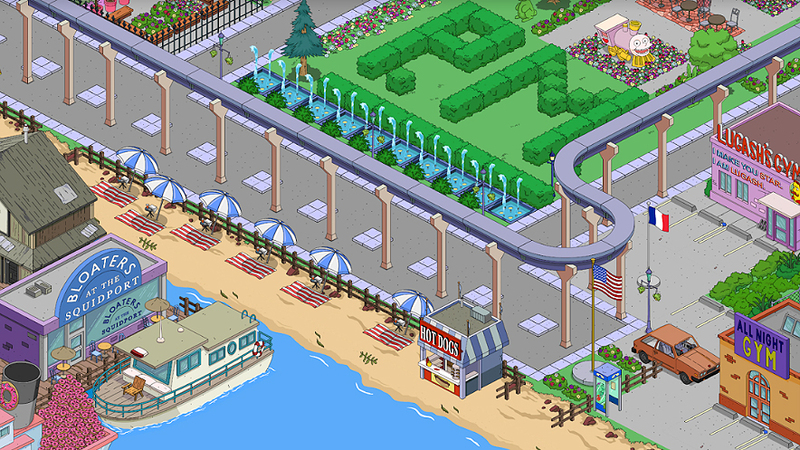 it’s really that ‘patch of Land’ in Springfield Heights – free it up already EA! (Lol!) I’m grateful we can Farm for 🍩’s and we can spend those 🍩 ‘s freely (turning in a Land Token for 12 🍩’s seems silly when we can earn more then that in 4 Hours doing to usual). I have 171 tiles still available to buy, with 32 tiles saved, hope EA open the Springfield hights land as well, great post. In my opinion, trying to base the fictitious TV town of Springfield with the “real” Springfield is pointless, because the TV and real ones parted ways from each other by probably the 2nd episode. Then the TV town took on a life of it’s own and left the real one in the dust. Like they said when the Radioactive Man movie was scouting locations, where else could you find all those different landscapes in one place? Certainly not Oregon. If anything, the TV Springfield is some magical portal to each and every one that Patric had on his map; it can move to whichever one has the locale that fits the joke. For me, I try to make my town fit the show when I can. Cookie Kwan is #1 on the west side, Springfield Heights, so that is my west and the water is then my south. Further, the friend screen has the water with the Squidport on the bottom. Naturally, one would scroll west/east and not north/south which would show the friend towns on their sides. At any rate, I’m comfortable with my reasoning for my town, and comfortable in the fact that further discourse would not get everyone to agree on one terminology. Ever. Uhm. Oregon offers Ocean, cities, mountains, high desert, rolling plains…what else is there? Oh. That’s right…we also had a guy named Matt Groening who created th3 show. My point was that NO place could possibly fit everything that has been in the show after 600+ episodes, but I made the mistake of calling out Oregon by name, so anything else I said is ignored. Yes… in fact me wife went to school with his sister Lisa, at Lincoln, HS in Portland. As always, Patric’s logic is impeccable. Nevertheless, I disagree. Why? Not really sure, I just always “felt” that North was NW on-screen (since everything is at a 45degree angle). That puts the mountains on a north-south axis, with Springfield Heights to the west. So I build my California in the SH area, at the far “left”, with the NW area being the Space Needle/Seattle, etc. Got the tar pits in CA, and geysers where Yellowstone would be. “North” in my main Springfield (Patric’s East), is my main new urban area, with the “ocean” due south. So I’m sure Patric is quite right logically, but if you have the ocean as your “West”, where do you put California? Is the entire beachfront the West Coast? Could be, but I want the rest of the folks to have access to the water. As always, YMMV! And thanks for the map – I’m gonna use that as the basis for my own map (when I get around to it). Sure. Except for the Groening factor. Has Matt ever lived on the East coast. Nope. I’d like to think that founding mothers were also involved in the naming processes. You’d like to think. But “Martha” and “Abigale” don’t even make the top 20. Where do you go to sell the land tokens for donuts? Do you 1st have to have a certain amount of land unlocked? Thanks in advance for your help. Does this mean calendars will be making a comeback too? If Hoosiers were going to bribe The Simpsons writers it would be with pork tenderloin sandwhiches. Didn’t someone (I’m thinking Patric) confirm that there are characters names after Street names in Oregon ? Flanders & Lovejoy come to mind. Absolutely… several. And Skinner’s butte is in Eugene. As is, the model for Moe’s. Max’s Tavern. Look it up. Can you confirm what the current item limit is as I think you have made an error in your post. I am not trying to be picky it’s just that I have already reached the limit and find myself storing items on a regular basis in order to put new stuff out. Thanks for the post and good luck with your latest Buyijja campaign. I did confirm it. The warning comes at 1250 currently… with the hard limit being 1428. At least for me. Are you seeing something different in Your game? EA Forum on 20 june 2018 says the item limit is 11,500. Seems you’ve forgotten a 0 somewhere and it should now be 12,500 for the warning and 14,280 (?) for the hard limit..
That is correct. Will fix. Remember, I wrote this at 3A…LOL! I’m going to go back and do this again… to make sure. I did it twice…but, I am old…and it was 3A…and…never mind. Let me check! I’m getting a warning at 10,700, with a ‘recommendation’ to stay around 9,200. For now I’ll be happy if it’s at 14-ish. I thought it was still 12k. OK… yes… sleep deprivation is an awful thing!! Here are the facts on limits. I got my warning at 12,050…and the HARD LIMIT is 12,200. I also tested it out and made it 12,200 as well. I used to just buy land. Now I buy rat trap trucks to get donuts to rush the GG to get land tokens. I still don’t use real money, but wow, EA sure made it tedious to buy land. Thanks for all your great work, although I would like to point out that the water doesn’t need to be a sea or ocean and the Springfield in Kentucky does have a Shelbyville to the north (also see: end of “behind the laughter”)c Cheers! But….is clearly a red haring planted by the writers. Groaning…admitted it was in Oregon in an interview with the Smithsonian…YeRdly Smith confirmed it while doing the commemoration of the huge mural in Springfield, Oregon. Finally…I’ve been to Kentucky loads of time. Nobody except for Cletus and his family, talks like people from Kentucky. BURN! LOL! Love the state. Gorgeous. But not the REAl Springfield. Great Post Patric. Personally I think the GGR building was an evil scheming plan from EA because at first we have free land and the ability to buy with in game money and everyone is happy, then they remove this and just give us land tokens which causes people to complain as we are drip feed land as and when they want us to have it. Now the GGR building comes in as a “fix” (because going back to the free land option would be too convenient and not money making} to this meaning EA gets a sudden influx of money from people paying for donuts to get the building and possibly spending more donuts to rush through and get all the land. Wow. That’s a lot to read and digest. Good thing we have a crappy snow storm on its way in a few hrs that will go all weekend. And being this close to chicago and the ocean (lake michigan) we are guaranteed from 1 inch to 3 feet thanx to the wonderful lake effect. ❄ ❄❄😡So i will have plenty of time to read this more thoroughly. Pat- u must have lots and lots in storage??? I have stuff in there i dont remember even buying/winning/earning! I just recently found my Cecil mansion stuff on accident! Nothing like an inventory that makes sense! Lol….